How can I add the weather gadget to my webpages? HOME > WEBSITE AREA > How can I add the weather gadget to my webpages? 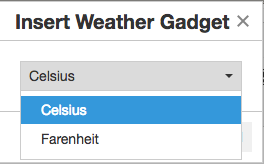 STEP 2: Select the page you wish to add the weather gadget by double-clicking or by clicking the OPEN button. STEP 3: Click EDIT button, find the PAGE INTRODUCTION or SIDEBAR CONTENT sections, according to your display preferences. STEP 4: Under the chosen section, select the weather gadget icon. STEP 5: It will be prompted a window where you will need to select your temperature scale. STEP 8: Do not forget to publish your changes, under WEBSITE tab, by clicking on PUBLISH CHANGES, so that all this information becomes available at your website. How will Weather Gadget look on the Website? The following example is only illustrative of how this form will appear on the website. This presentation will depend on the website template. If you select PAGE INTRODUCTION section, the gadget will appear on the relevant webpage body; if you select SIDEBAR CONTENT section the gadget will appear on the webpage sidebar.